The day started well as the sun was shining. The eldest of the cats started following us around as he doesn’t like us going away and knows we are because of the packing. He will ignore us when we get home! Our punishment. The plot has changed. It seems that the people organising both the RHS Botanical art show and the Orchid show are under-manned. We could see that there was some rushing around and stressed responses. Luckily, as I have exhibited once before I didn’t need to ask too many questions – although it has changed a little since last time. Regarding the change in plot and the shortage of staff, it has affected when we will know the result of the judging. I’m afraid that we have to wait one more day. They are still going to judge the botanical art show tomorrow morning, but they apparently can’t do the Orchid show stands until Friday morning. This means that they want to give all the results and medals out at the same time on Friday. Even people attending the show for the preview and the Friday morning will have no idea of how each of the exhibits have been judged. This isn’t only just a shame for us (prolonging the agony – although just 24 hrs isn’t going to make that much difference), but for those who are coming to have a look. But I can imagine it is worse for those exhibiting live plants. 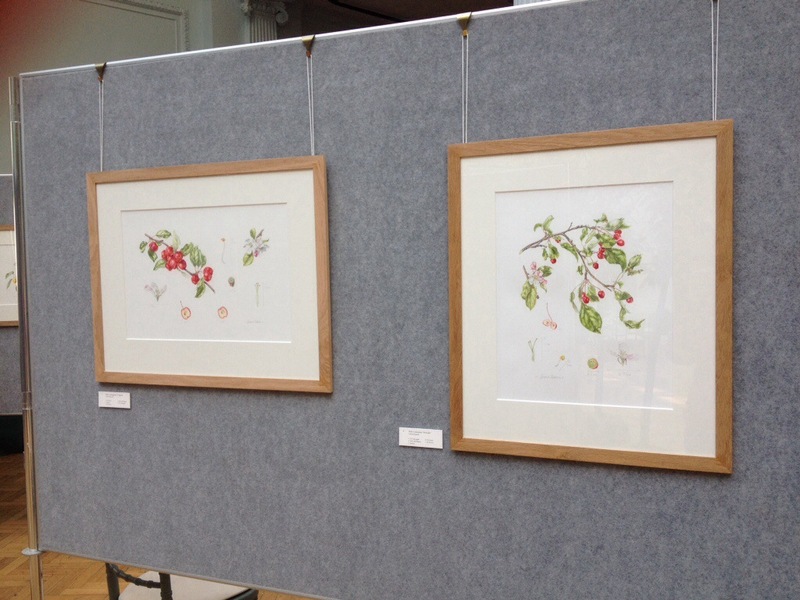 Anyway, we have set up my exhibit of the six crab apple pictures painted in coloured pencil. I will show you snaps I took of the three panels in this blog. There are a lot of lovely exhibits there and I think it will be well worth a visit. 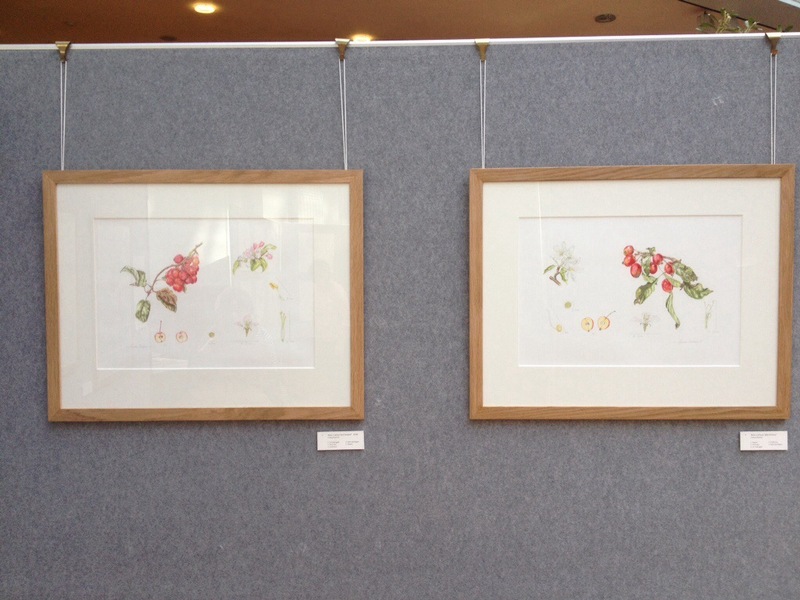 Artists from all over the world are exhibiting with paintings of flora from their own countries. Some of which are really interesting. Although not everyone had arrived when we left, I saw one exhibit in graphite and the remaining, except for mine seemed to be in watercolour. A couple had used watercolour for their main subject, with background in graphite. There was little vellum as most was on paper – but there was some. My next challenge! I didn’t go into the other hall where the Orchid show is, but no doubt I will get an opportunity at some point. I will try to get some pics of that too. My husband has disappeared off to his meeting in Manchester and we had a nice meal together before he left. I get a slight lie-in tomorrow morning as I don’t have to be at the Lindley hall until 12:00, for annual awards – not ours!!! 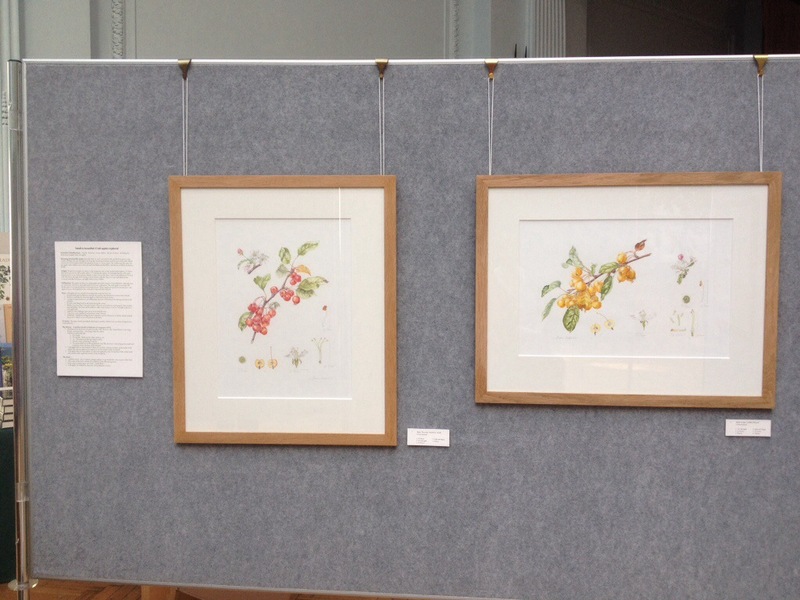 For those of you who can, do come and visit the RHS Botanical Art Exhibition at the RHS Halls, Vincent Square, London. It’s not far from Victoria railway station. The preview for RHS members is tomorrow evening from 18:00-21:00. It is open on Friday and Saturday 10:00-17:00. I hope to see you there. Do make yourself known to me. I’m coming up to see the exhibition on Saturday – really looking forward to it. I really look forward to seeing you. Grab me when you come. Thank you Sarah. I will need it. I am going down tonight, for the preview, and again on Saturday. Look forward to see your apples. Hei Alena, I am looking forward to you seeing them. They will obviously be different in real life, so your opinion will be appreciated. Please make yourself known to me.